Prince Edward Island’s (PEI) beauty lies in its inherent culture of warmth and friendliness. Each resident here possesses a genuine kindness that is both rare and inviting. As nuns at Great Wisdom Bliss Institute (GWBI), we are very grateful to have this opportunity to study in an environment with such kind neighbours. Therefore, in order to help preserve the environment of PEI, we were very excited to join hands with the Women’s Institute and participate in their annual island cleanup. With a total of 120 nuns, our mission was to help clean the areas of Vernon Bridge, Brudenell, and Montague. We are very thankful for this chance to learn about the environment around us, as well as practice what we learn every day at the monastery. 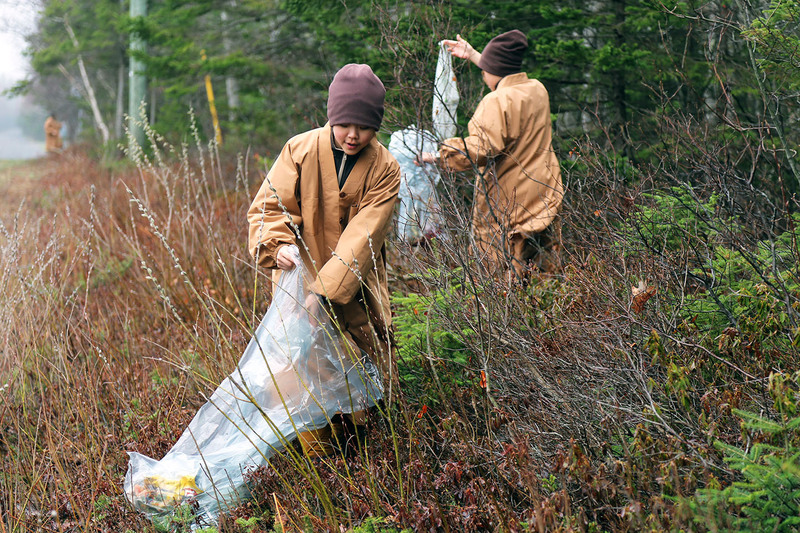 At first, we did not realize that picking up trash could be a form of Buddhist practice. However, after thinking about the impact of this action, we realized that this event allows us to practice both compassion and wisdom. By being both compassionate and wise, we deeply aspire to have the ability to remove all of life’s troubles and suffering, as easily as lifting up pieces of trash. If we all can have a very clean and pure heart, we believe this world would be a very happy and peaceful place. While finding plastic bags, old signs, used bottles, electronics, etc., we sent many blessings to everyone on PEI and in this world. On some occasions, we hesitated to pick up sharp objects. As we thought about how these sharp objects may be mistaken as food by birds or other animals, we were immediately re-energized and determined to continue. We were very happy that we could practice our goal of helping all beings. During this year’s island cleanup, we were very touched by the island’s support. As Buddhist nuns, our appearance sometimes may cause others to be curious or hesitant to approach us. On this Sunday morning, dressed in our brown-colored clothes, we felt rays of sunshine from each PEI resident who passed by us. As we were picking up trash, there was a lovely lady who graciously prepared apples for us, even though she had never met us before. Another person generously offered us ice cream and beverages. Each time cars passed by, the passengers would wave excitedly to encourage us. We felt tremendous enjoy and believed that this year’s event was a team effort not just by us, but also by everyone living here on PEI. We believe that we have learned to grow and expand our views in several ways by being involved with the community of PEI. Even after picking 250 bags of trash, everyone still held a very positive spirit and looked forward to next year’s island cleanup. We are very delighted to help contribute to the beauty of Prince Edward Island!